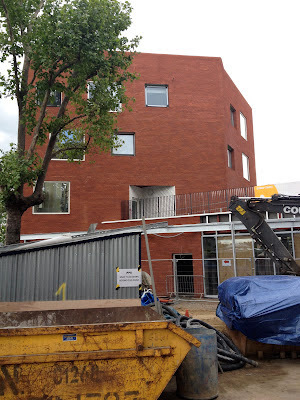 In a week of schools nearing completion (see previous entry), I was also delighted to be invited to attend a 'topping out' ceremony of a major school extension in a London Borough a few days ago. Having been involved in all the designs sessions from the start it has been a great if complex project. The school has almost zero outside space and is surrounded by roads and the Underground. The photograph above shows skips and building 'stuff' covering all that is left of the playground. The space really is tiny! Developing a new Year 7 block, kitchen and dining area in this space was a challenge and really the only way was up. We included an outside social area on the roof of the dining room to maximise the efficiency of the site. One of the highights of the afternoon was, as usual, the faces of students looking around the new spaces for the first time. They were really excited by the building and quite jealous that they would probably not be having lessons in the new classrooms that are designed for a wide range of teaching styles. Everything about the new build has been modeled and trialled by the school in advance, from layouts, positioning of boards, types of furniture, the ICT used down to the type of carpet. Nothing has been left to chance - it is the best prepared schol I have worked with. One of the exciting things about the school is that they have also really tried to maximise the learning potential and opportunities available from having a major construction site on the school grounds. The students have been involved with several decisions on the project. It's a unique opportunity for schools to relate learning to a real project. I just wish more schools did it.